Crime maps often show only counts, but this map uses census data to show crime as a rate, giving a more accurate picture. Hover over the map above to view crime rates by census tract. Use the zoom tools in the upper left to better locate your neighborhood. The city has large variations in crime rates. 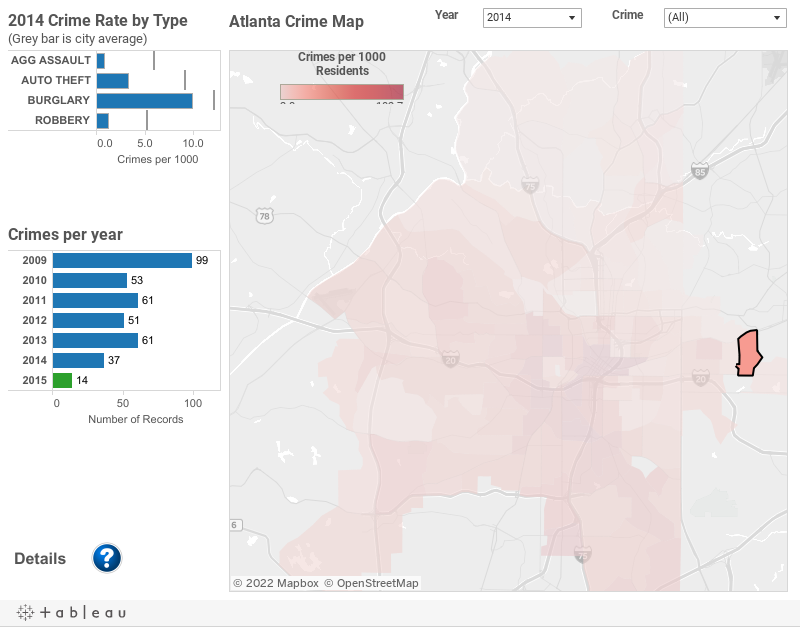 The northern Atlanta neighborhood with the lowest crime rate in the city (between Northside Parkway and Peachtree Road), has a crime rate of 2.8 per 1000 residents, while some neighborhoods have crime rates of over 100 per 1000 residents. To better understand the map consider the graph below with my own neighborhood highlighted. In the "2014 Crime Rate by Type" graph, I'm glad to see that my neighborhood's crime rate is below the city average for each category. Burglary is the most common crime and closest to the city average as a percentage, which seems to mirror the concerns I see on my neighborhood Facebook page. However, that rate is about 10 per 1000 persons (1%), so risk of being burglarized in a given year is not high. The "Crimes per Year" graph also has promising trends for my neighborhood. Last year (2014) was a relatively low year for crime in my neighborhood, and there has been a large drop since 2009. 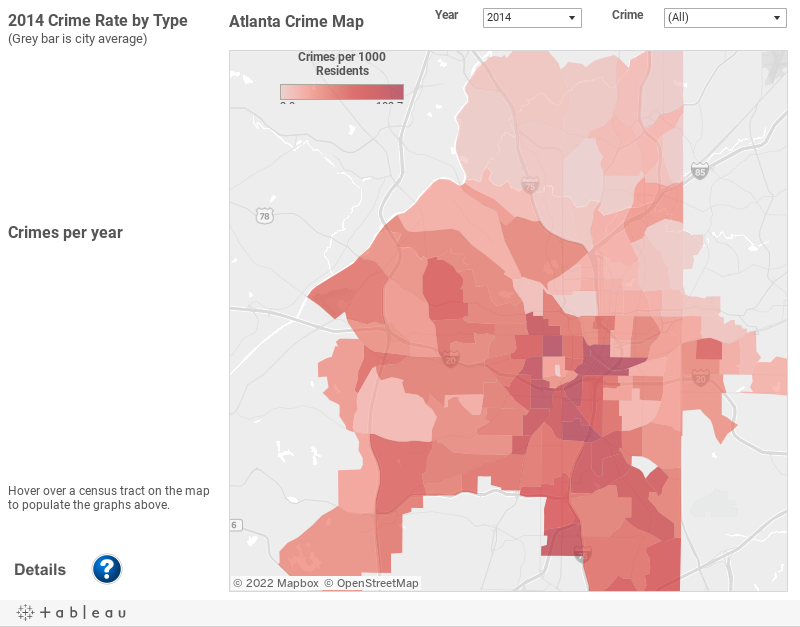 These maps include all crime recorded in the public Atlanta Police Department dataset, with the exception of larceny (theft without unlawful entry or threat of force). Larceny was excluded because it includes shoplifting, and resulting maps then show highest crime rates in commercial areas, and differing levels of residential crime are harder to see. The maps above use census tracts instead of city neighborhoods because census tracts have better population data. The visual below uses neighborhoods to show changes in crime rates and to map the location of each crime. Larceny is included in these maps. Again, my own neighborhood is highlighted, but the user can click on any neighborhood using the graph on the left. 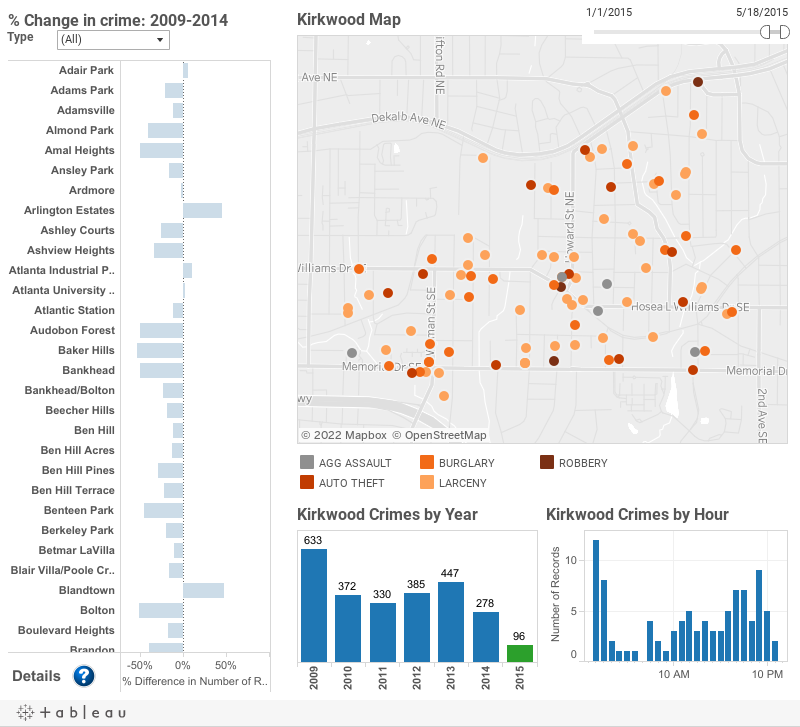 The map shows exact locations of crimes and I'm able to see there were only three robberies (the category that includes muggings) in Kirkwood during the first half of 2015 (January-May 18). I also found it useful to pick a longer time range (slider on top right) and a single crime type (drop down on the top left), then see what times of day that crime occurs. In Kirkwood, robberies tend to happen in the evenings, but burglaries are more likely to happen in the morning. Update (7/12): I had a couple people ask about the relationship between income in crime. It's pretty strong; see the graph below. Census tract income data during non-census years is not very precise (I'm using the ACS 2013 five-year file); otherwise the relationship would be even stronger. For a more information on to build these visuals, see this post. This is fascinating. I especially love that you share your steps and rationale - it helps the rest of us keep up. Thanks for sharing, John! A hyperbola might be a better fit to the data than whatever function was used. I’m impressed, I must say. Really rarely do I encounter a blog that’s both educative and let me tell you, you have hit the nail on the head. The issue is something that not enough people are speaking intelligently about. I am very happy that I stumbled across this in my search for something relating to this. Truly, you work resembles a wow and everyone stay surprised and talking about this deck. You take a shot at this deck with the compelling way and I simply respect the great characteristics of your work and high quality writing service provides useful task. You are looking so encounter individual.